Ryoma Echizen just joined the Seishun Academy's tennis team, which is known for being one of the most competitive teams in Japan. Its members are incredibly talented, gifted, and athletic. With rigorous and extremely intense practices, the upperclassmen of the team expect the very best from themselves and they expect even more from the new members of the team. While most of the freshmen are on pins and needles hoping they won't get cut from the team, Ryoma Echizen is confident, cool, and collected. Some might even say he's cocky, but at least he's got the skills to back up his attitude. With his virtually unreturnable "twist serve," Ryoma is sure to make the starting team. Join Ryoma and the other first years, as they train hard, make friends, and try to find a place for themselves on the team. Ryoma Echizen is the Prince of Tennis. He may be ready for the Seishun Academy tennis team, but are THEY ready for HIM? By the way, the Tennis skills in this series is completely beyond normal human standards and includes but is not limited to burning holes in your opponents rackets, striking your opponent so hard he flies several dozen meters, travelling in a spiral in mid air and even shutting down your opponents senses so that they cannot see, hear or feel (somehow) and therefore, has been put under the "Fantasy" genre. NOTE: It has been announced that these 379 chapters serve as a prologue to a new series currently in the works. 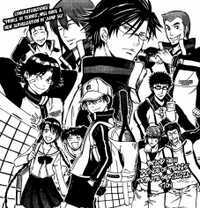 See "Shin Tennis no Oujisama" for continuation. ANOTHER NOTE: Also, there is a short collection of 4 panel comics under the name of "Houkago no Oujisama", or "Prince of Afterschool" featuring characters and inside jokes from this manga.